Got a few hours to work on the plane today. I temporarily fit the roll bar. 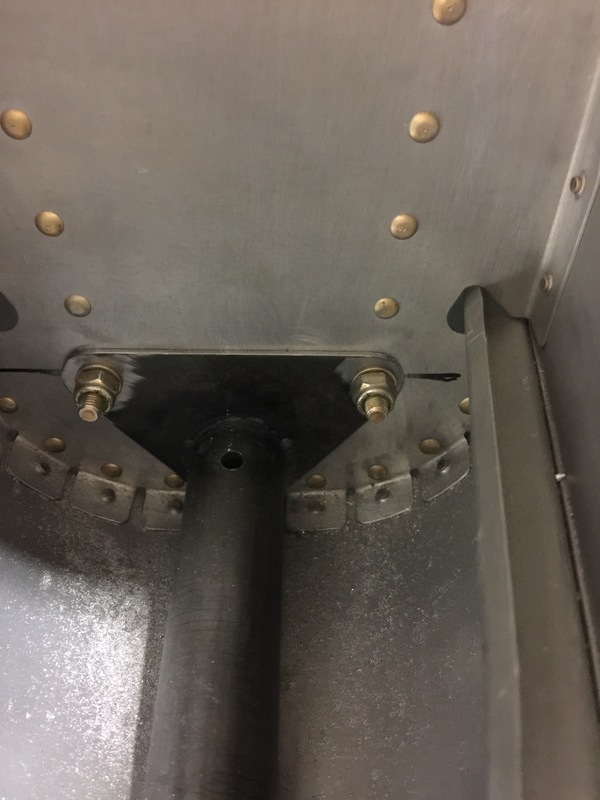 Here you can see the bracket doesn’t fit one top of the flange. For the tip up canopy it needs to be trimmed. 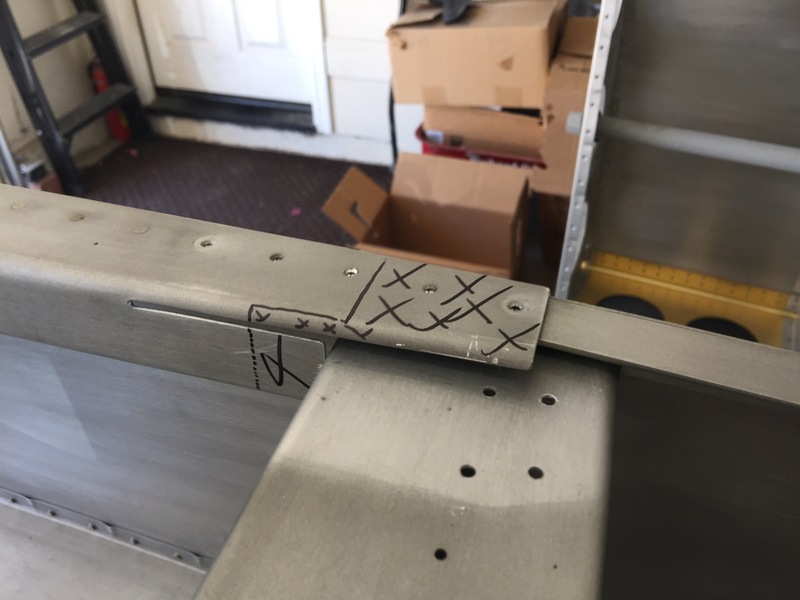 Here I’ve marked where I need to cut the metal. This is after I’ve removed the required material, I rough cut using my angle grinder and then filed it down to the line. I radiused the corner and then hit the whole thing with scotchbrite. It was a lot more difficult that I thought. I then spent some time fitting the seatback slots to the cross beam. I’ve clamped the angle bracket, to the brace here and used some #30 drill bits to get the 1/8th spacing required. Here’s another view of the angle after I’ve drilled it partially to the cross brace. 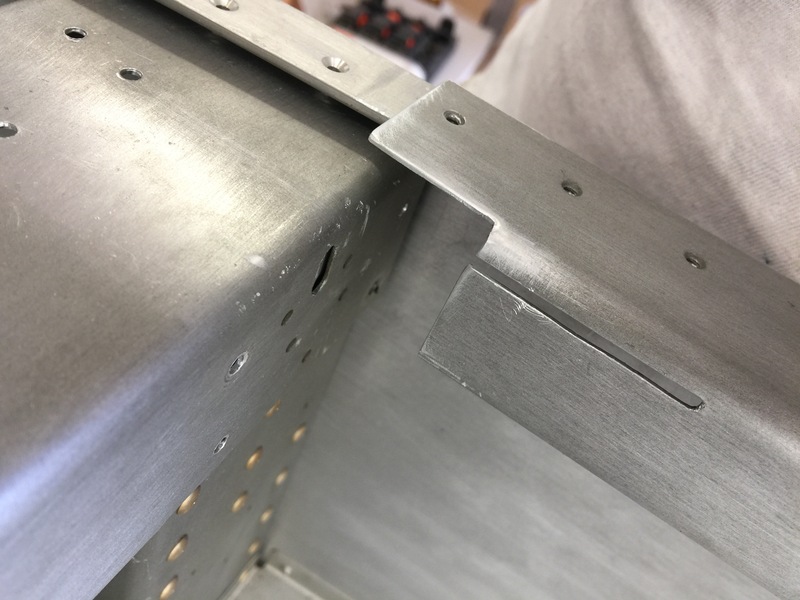 I also marked out the holes for the canopy attach slots. These need to be modified for either slider or tip up, luckily it wasn’t too difficult. I then refit the roll bar to the fuse after fitting everything back together. I still need to adjust the height of the roll bar. 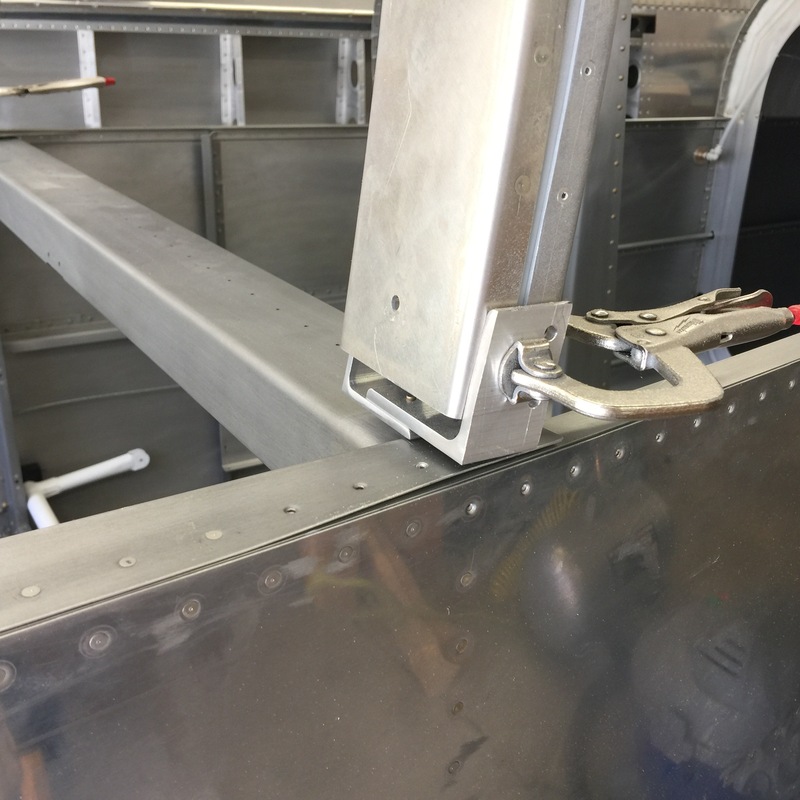 Here’s the aft channel clamped. This will get drilled to the roll bar and riveted together. Today I came home to a lovely piece of mail. 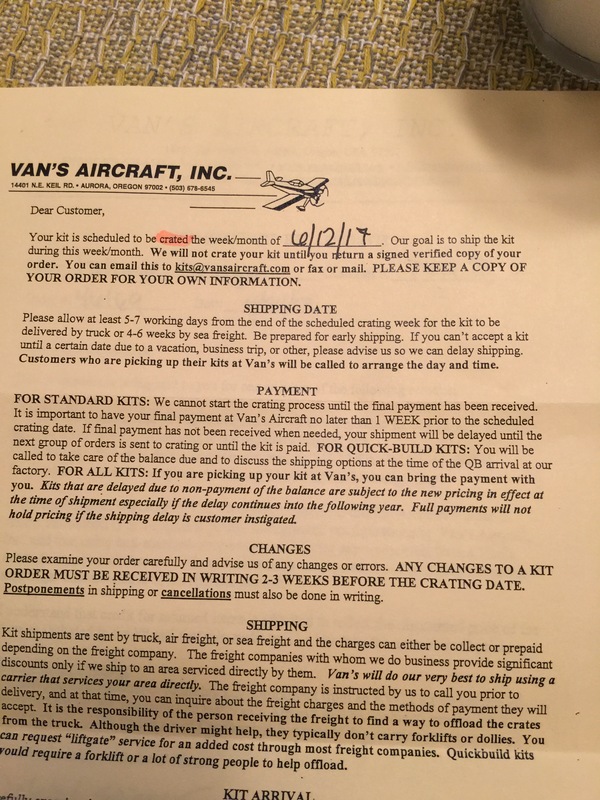 I received my confirmation and approximate shipping date! If I assume the earliest shipping, that gives me just about 6 weeks before I get it. There’s plenty to do, but it should be plenty of time t finish everything that needs to be done. Tonight I spend a couple hours in the shop. 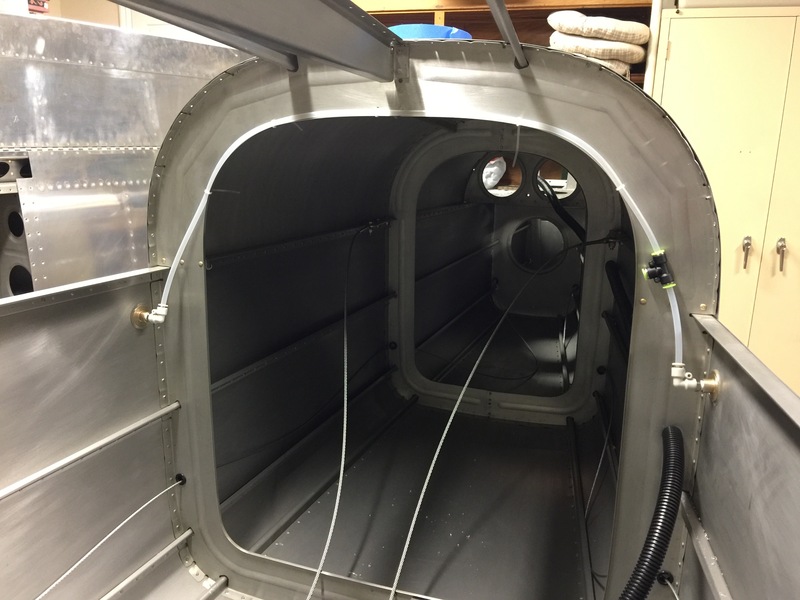 I began by installing the static ports to the side of the fuselage. This is the exterior. It sits about 1/32th of an inch higher than the skin. There’s another one on the other side of the fuse. 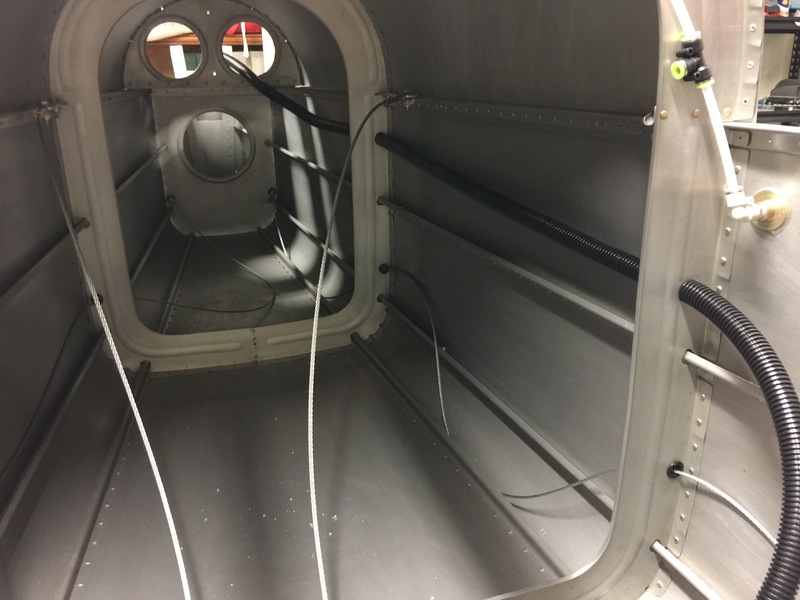 Here you can see the two static ports connected together and a T fitting to combine the two to be able to attach the static line to the avionics. I then installed the two seatbelt anchor cables. They are held on by an AN4-7A bolt. I had great difficulty torquing these because of the lack of reach. 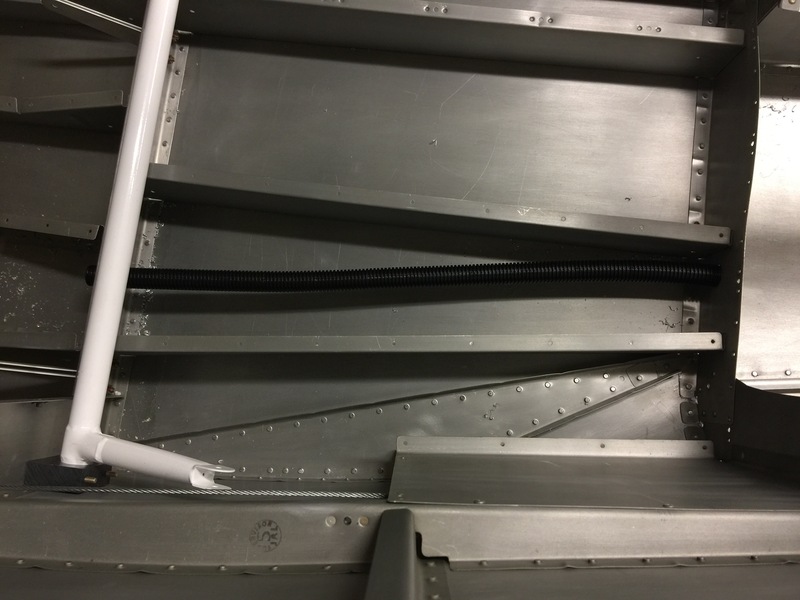 I finished off the night by installing wiring conduit under the baggage floor, and down the side of the fuse to the tailcone. Here’s the conduit. The baggage floor will be riveted on top and access will be non existent. 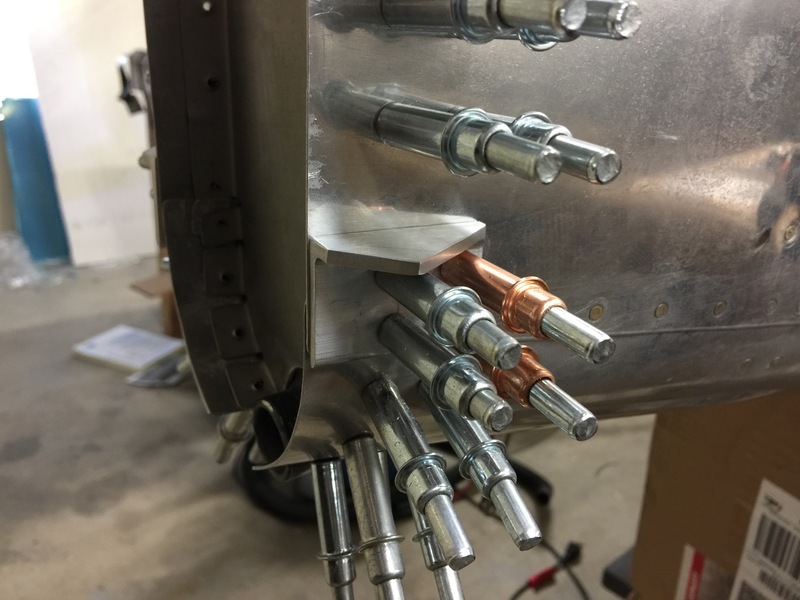 Here’s the conduit going to the tail. This I incredibly loud snaking this through the 3/4″ holes. This will house the wires for the trim servo as well as for the tail strobe and position light. 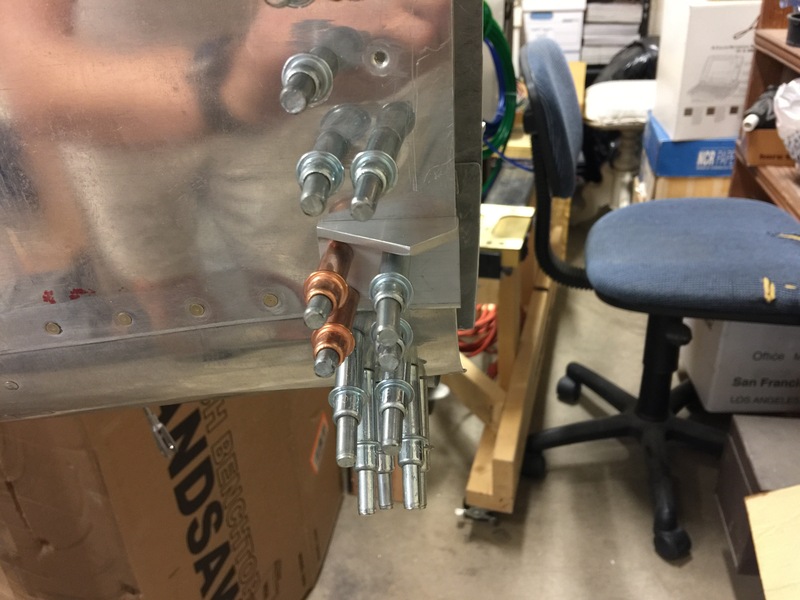 The conduit will also get anchored with some zip ties. Tonight I spent about 3 hours working on the rollbar. It’s a very tedious job and requires a lot of precision. I began by placeing the plate I made last week onto the two rear channels. After measuring and checking the width of the rollbar I drilled the plate to the channels and clecoed it in place. I then placed the lower strip into the channel. 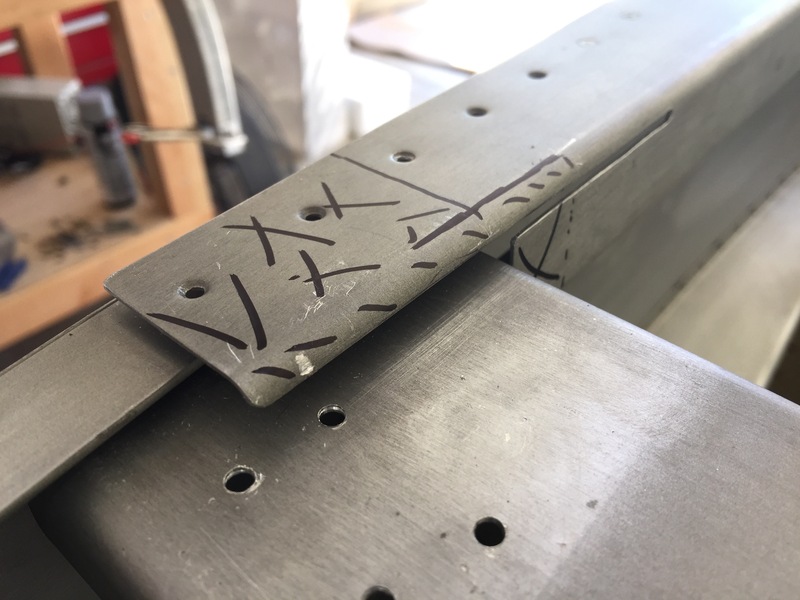 I measured the rivet holes and used my center punch to mark the points. 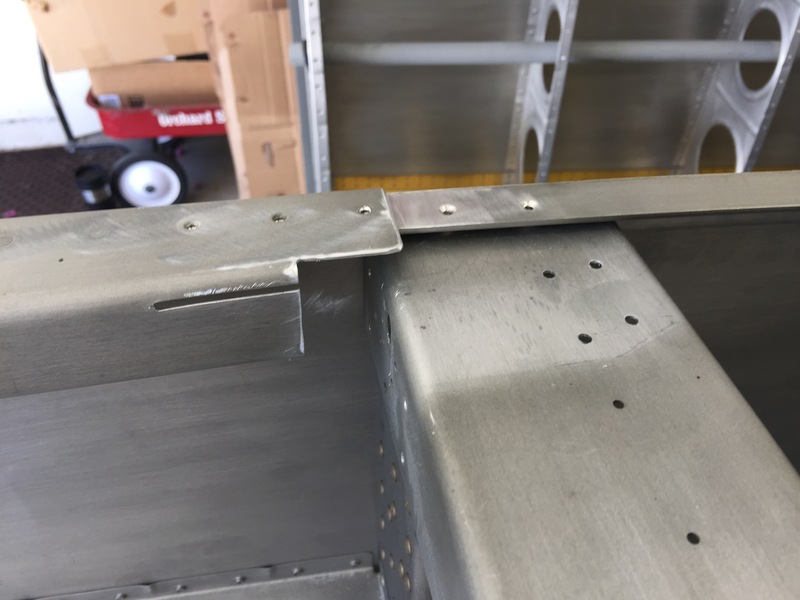 The holes are 1.5″ apart and 1/4″ away from the edge of the channel. This is the first half of the lower strip drilled and clecoed. It doesn’t look like much, but this alone took me about 45 minutes. Where’s the inside of the strip. I managed to finish both sides of the strip and everything measured up perfectly! I then proceeded to do the top strip. It’s the same process. I then took out the other half of the rollbar and placed that on the strips and clamped them in place. I’m using blocks of wood to keep it off the table, but I’m not happy with the potential for it to twist. I’m going to figure out a better way to do it. Tomorrow I’m hoping to finish up the rollbar! 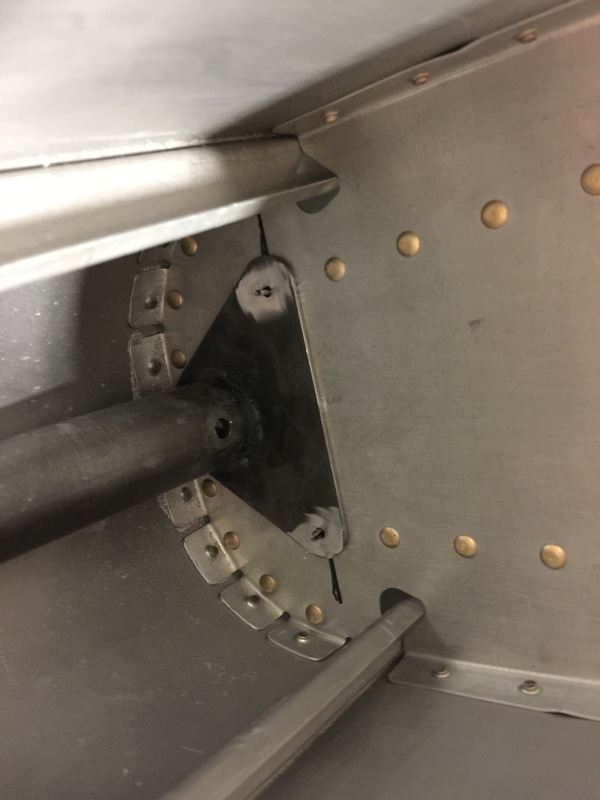 This weekend I got in a few hours of work and finished off the tailcone. 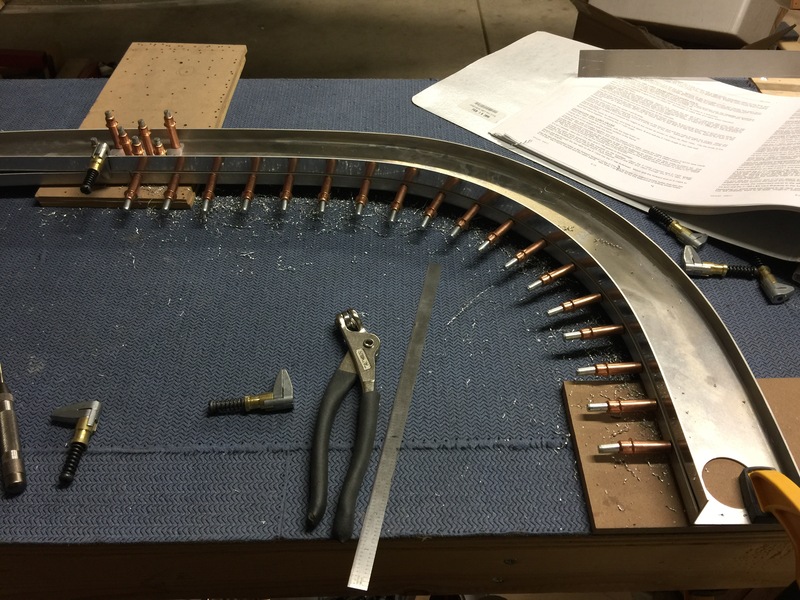 It was quite a lot of work aligning and measuring the tail wheel mount. 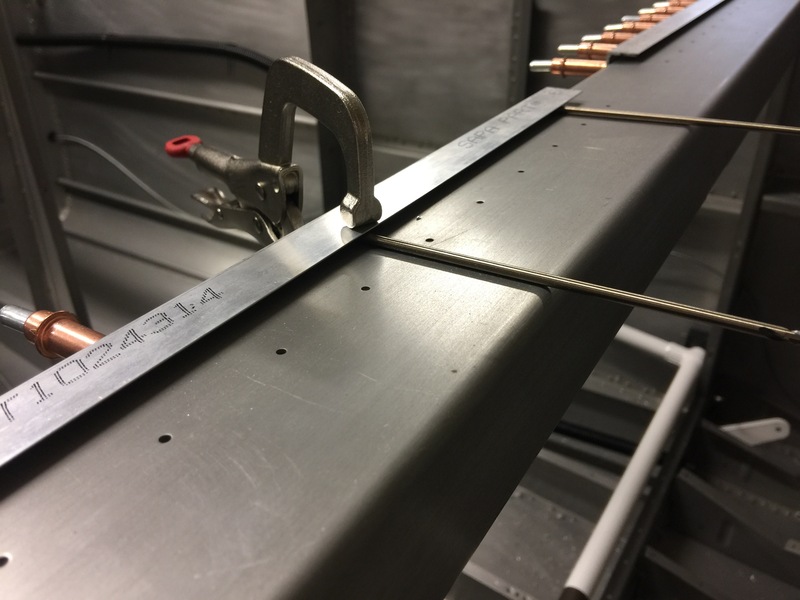 It needs to be aligned perfectly so that when I drill vertical stab to the assembly, I meet all the edge distance requirements. 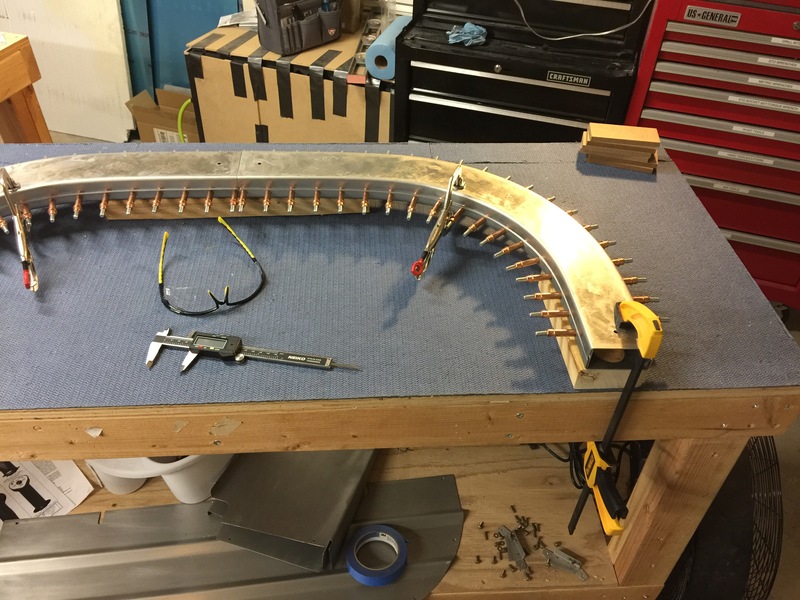 Here’s the weldment after it was primed and installed. The alignment is perfect, measuring 5 times and drilling once really does pay off. 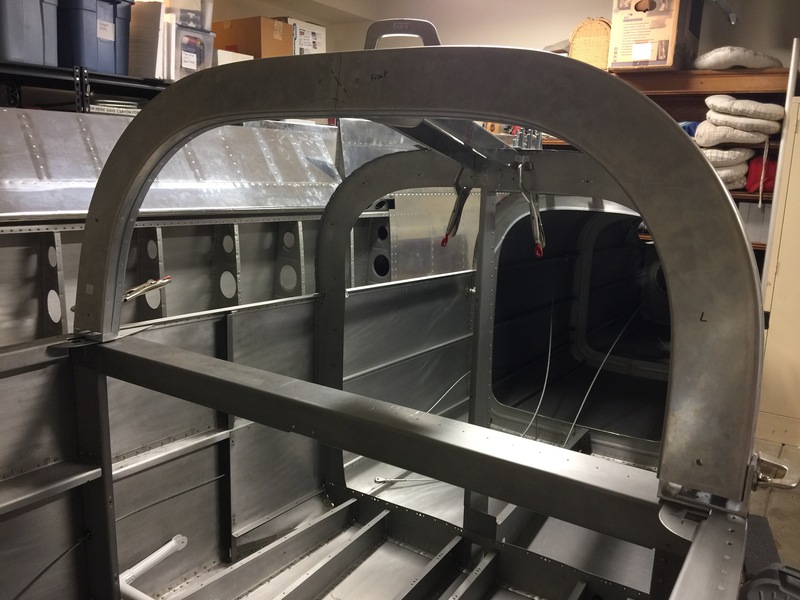 Here is the aft bulkhead riveted on with the rudder stops. I actually had a lot of fun fabricating those parts. I then decided my next project will be the rollbar. I spent a solid hour cleaning up the shop and putting tools away and vacuuming all the aluminum scrap. I tend to be a bit lazy when it comes to putting my tools away, so I have to do big cleanups every once in a while. 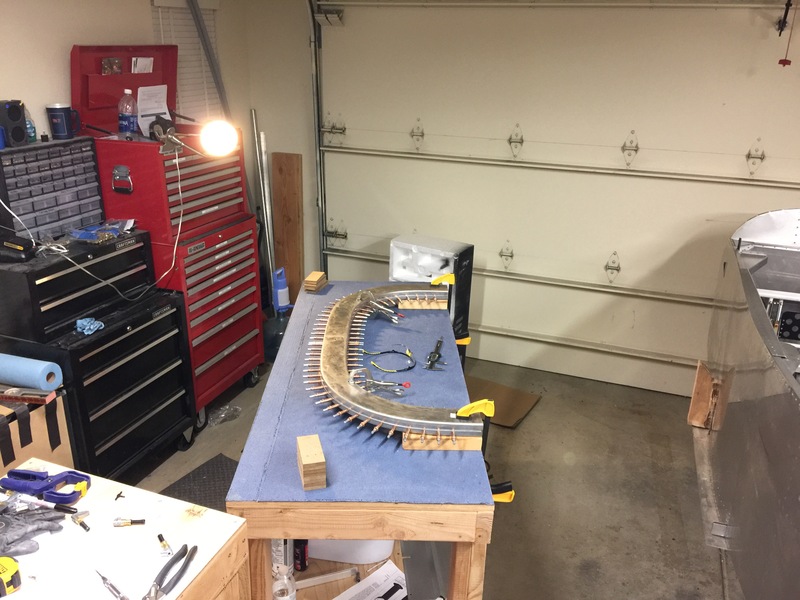 I started by getting the aluminum channels out and clamped them to the table. It will take some adjusting to get the alignment right, but so far measurements have come out perfect. 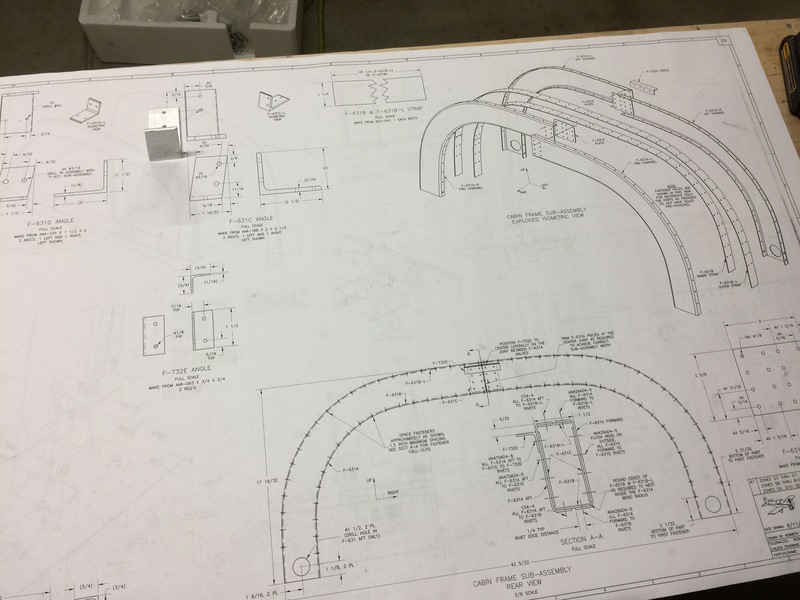 I then fabricated the two plates that will join the channels together. Along with all the L brackets that needed to be made. 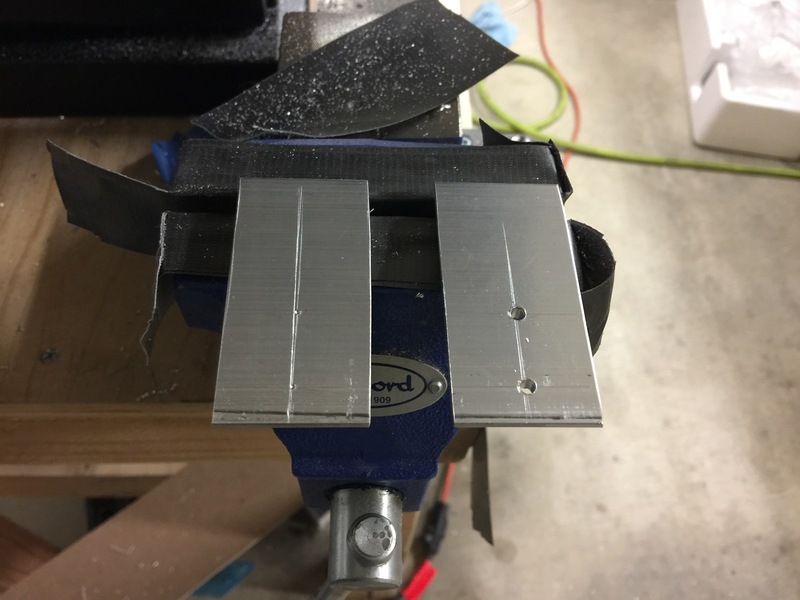 I can’t say it enough…but my bandsaw is the greatest tool I’ve purchased! Here’s the full sized drawing to give a perspective of what I’m working on. And a completed L bracket in the top left corner. 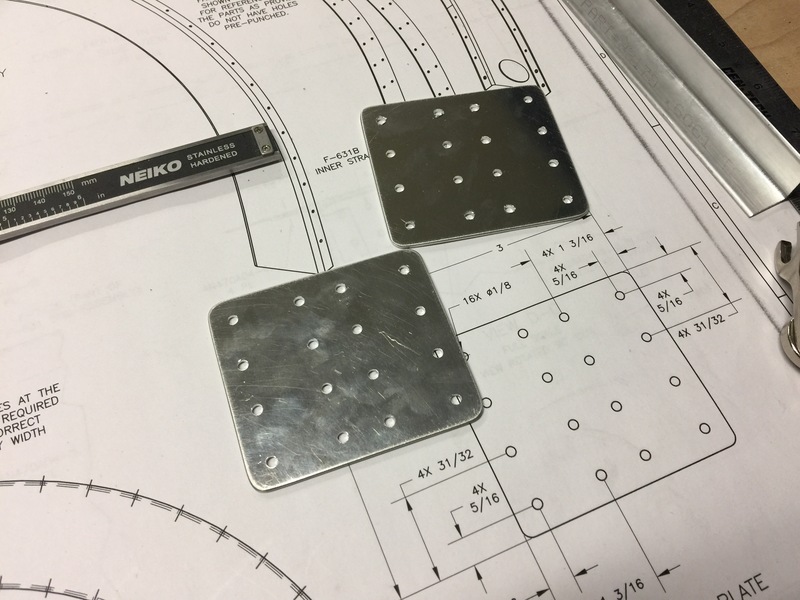 Drilled the holes to #30 per the drawing, but they will be opened up to 1/4″ for the bolts when it’s mounted to the fuselage. Hopefully I get some time this week to work a bit more, but I’ll play it by ear. 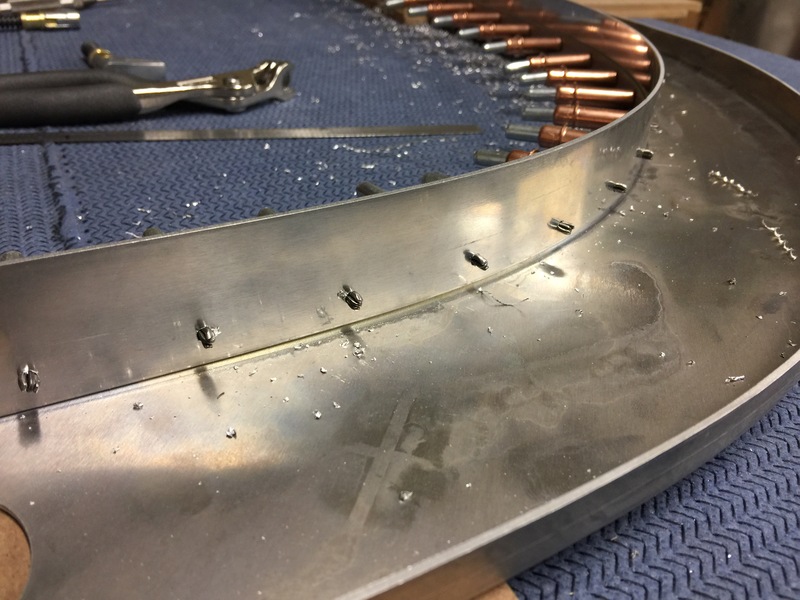 Another day working on the weldment and the fit of the tail wheel mount. Being a quick build fuselage, all of this work has to be done somewhat out of order. 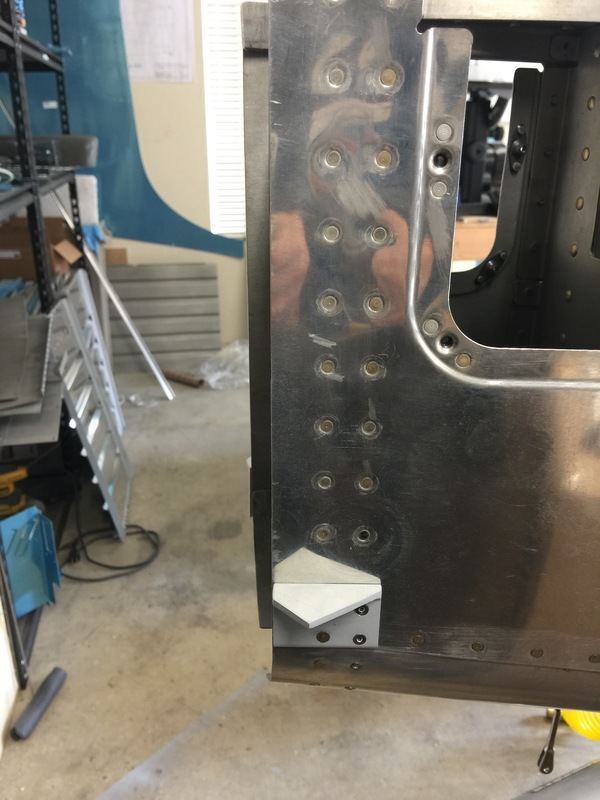 Here’s the weldment aligned and drilled to match the bulkhead. 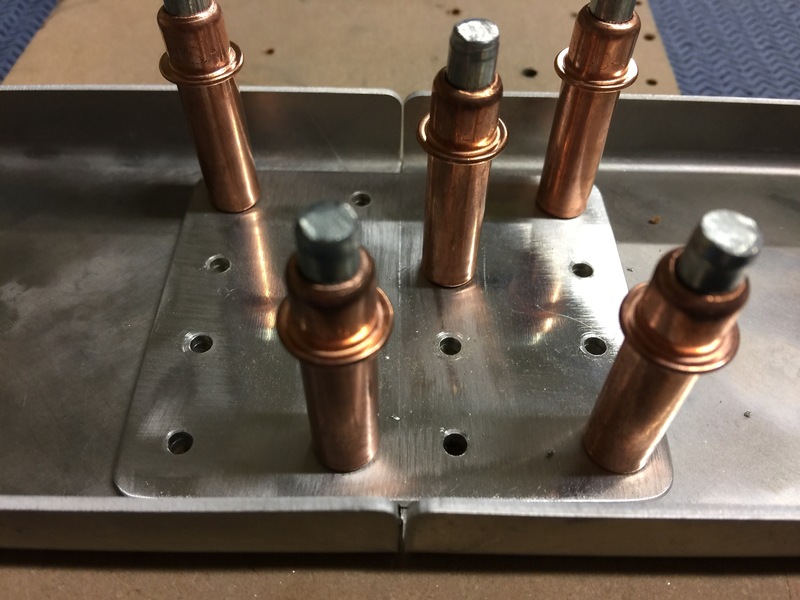 These were measured and originally drilled to #30 so that I could hold it in place with clecos. Here’s the mount sandwiched between the two bulkheads. 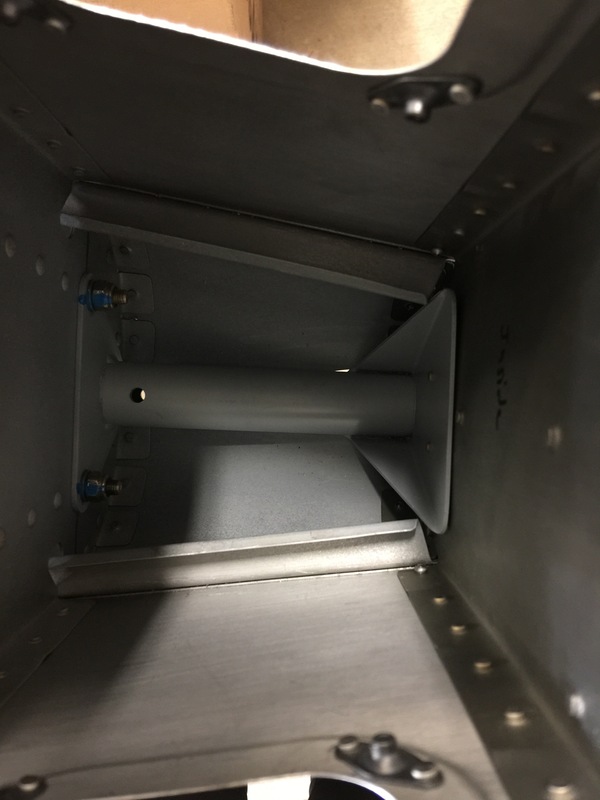 This is looking in from the top of the tail cone. 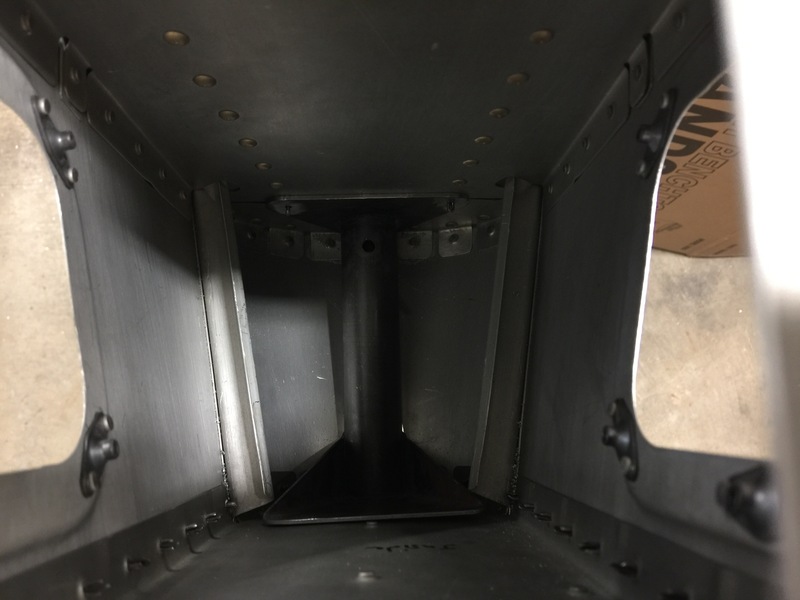 It’s a bit hard to see but there’s a very small gap between the weldment and the aft most bulkhead. 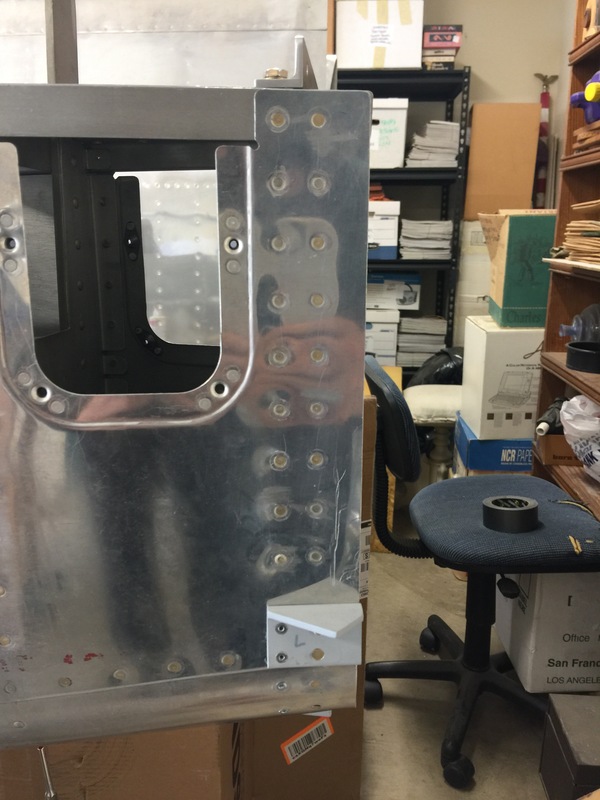 I’ll fabricate a wedge out of some scrap aluminum and it will fill the gap. 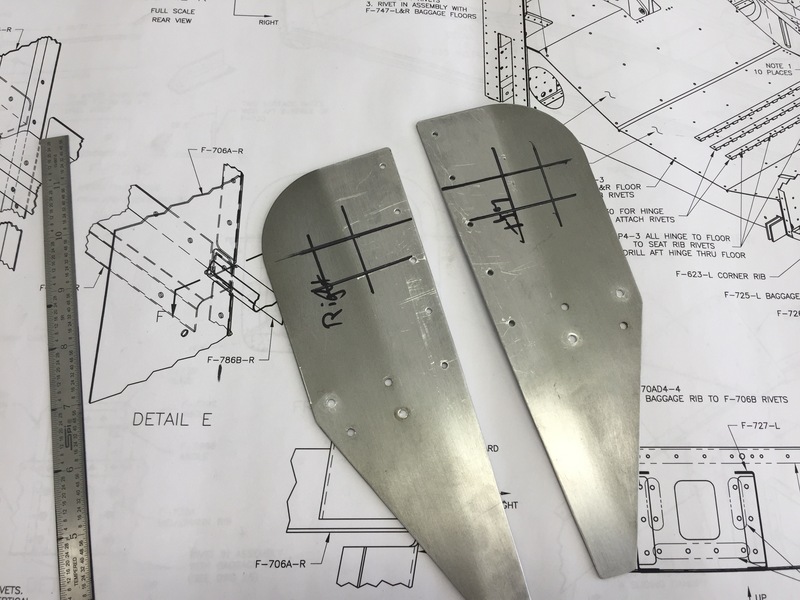 I then fabricated the rudder stops. 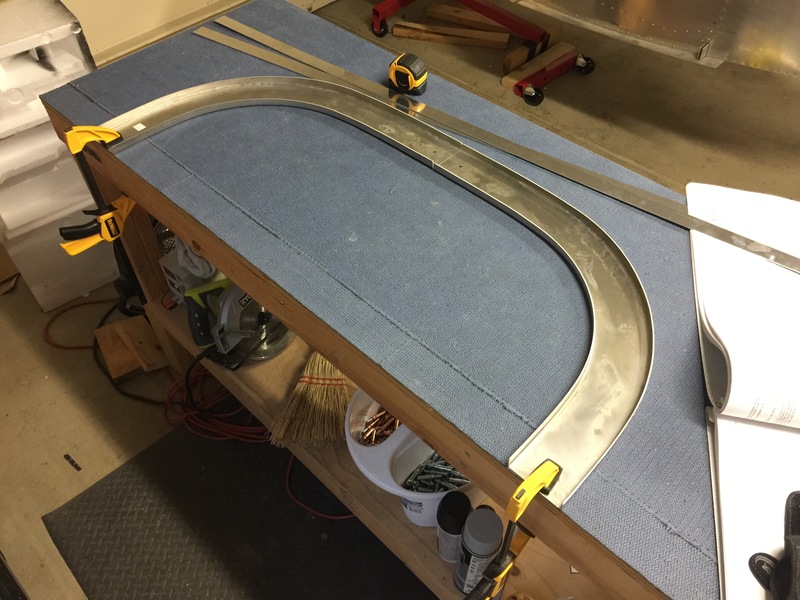 They are made from .125″ thick aluminum angle stock. I then match drilled and clecoed them on to verify alignment. 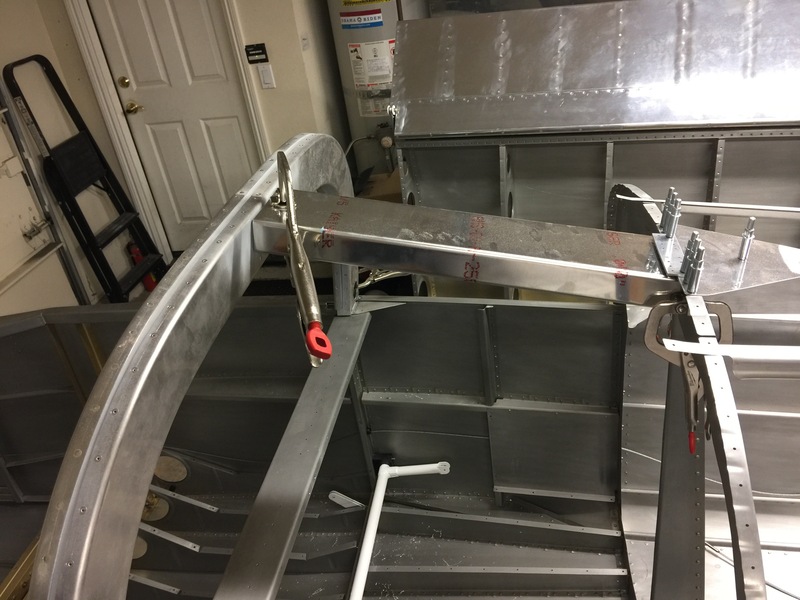 They might need some slight adjustment once I fit the vertical stab and rudder. After measuring and aligning multiple times, I enlarged the initial holes to final size for the AN4 bolt. 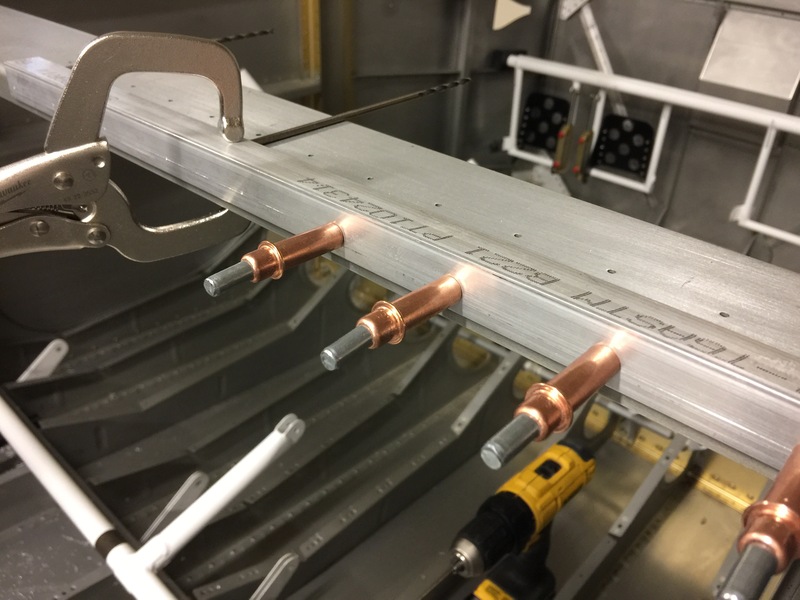 The steel is substantially more difficult to drill through than the aluminum. 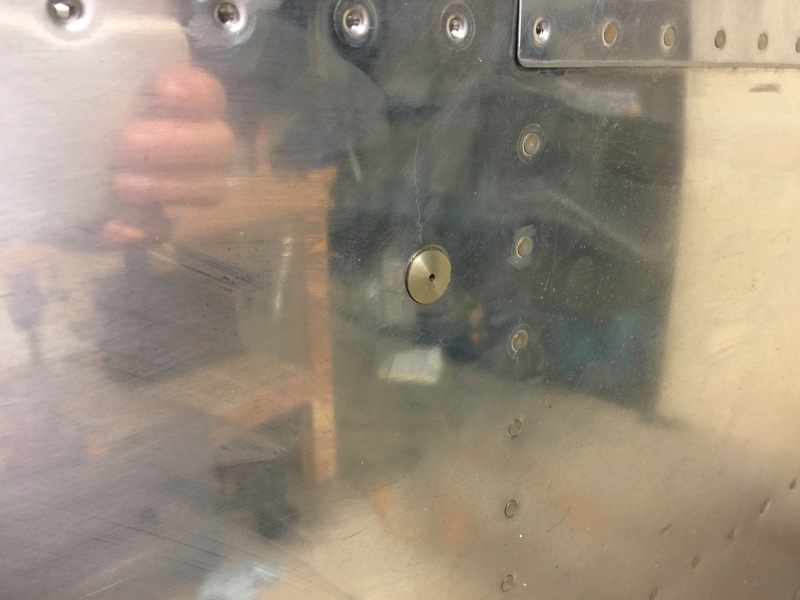 I also drilled a hole in the bottom of the fuse skin to allow access for a socket wrench to reach the bolt that will bolt the tail wheel spring in the mount (that’s the hole in the weldment). 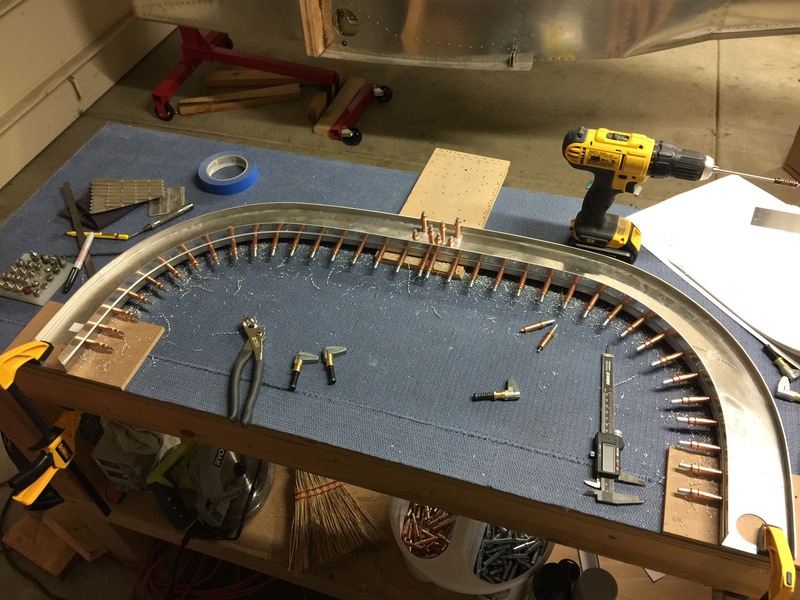 Next up is to remove the weldment, surface prep and the prime it and install it permanently.